Dehumidifier in Souq Shop, Dubai, Abu Dhabi, UAE. The United Arab Emirates is a Constitutional Federation of the seven magnificent Emirates. With a sandy landscape, the climate remains dry with high temperatures and humidity almost throughout the year, with July and August being the hottest months. Considering this high amount of humidity and temperature, it is essential that remedial measures be taken to battle the heat thereby, ensuring a comfortable and healthy living. Not only living things, it also affects antique, heritage or sensitive objects that are prone to damage due to high water vapor content in the atmosphere. A Dehumidifier becomes crucial in such a scenario. Vacker UAE's Dehumidifier to the rescue! A device that brings down the level of humidity in the atmosphere, giving us the much needed comfort and ease of living. Vacker UAE is an established supplier of Dehumidifiers for years across UAE in Dubai, Abu Dhabi, etc. A Dehumidifier is essentially a device that works on the principle of conversion of moisture in the air to water. The moisture from the atmosphere is absorbed through an inlet within the Dehumidifier. This moisture is then compressed, with the help of an inbuilt compressor. As a result of compression, water is generated, which can then be used for any other purpose such as gardening, etc. Where to purchase a Dehumidifier from? Numerous options are available on the Internet today, for purchasing Dehumidifiers. Right from online e-commerce portals (such as souq, bestbuy, etc.) to online stores and dedicated websites, the market is diverse and the competition, fierce. In such a scenario, a customer who is in need of a Dehumidifier, and with little or no knowledge of Dehumidifiers can be misled into buying a product either of low quality or of a higher price or not suited to his needs. Understanding the dehumidification process and the capacity of the Dehumidifier thus needed, is a complex process which needs prior knowledge. Though, Dehumidifiers are available on online sites like Souq, etc., the guidance and information needed in purchasing one is not available. Vacker UAE simplifies this process by providing an online tool (Dehumidification Capacity Calculator) that can be used to calculate the Dehumidification capacity. We, at Vacker UAE, treat each customer with utmost importance, understanding their needs and requirements, and providing suitable solutions thereafter. At Vacker UAE, we have a team of skilled engineers who have had the privilege of being trained at Trotec, Germany - our esteemed supplier for Dehumidifiers. It is often noticed that due to lack of technical knowledge, a customer is unable to find the dehumidifier that suits his or her needs. For such scenarios, our technical team will guide you through the entire process of understanding your requirements to selecting the right type of dehumidifier, to the installation process by our technicians and follow-up. We also have our online Dehumidification Capacity Calculator to facilitate users to understand their requirements clearly. Vacker UAE supplies various models of Dehumidifiers across the Emirates in Dubai, Abu Dhabi, etc. 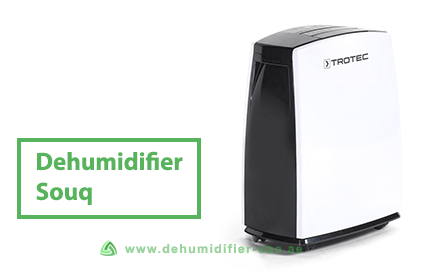 While some models of Dehumidifiers may or may not be available online on sites like souq, bestbuy, etc., Vacker UAE provides you with an extensive list of models in the market. As the name implies, these dehumidifiers make use of a Desiccant or a drying substance such as Silica gel that absorbs the moisture from the air through an inlet, which is then converted into air and released. These dehumidifiers make use of a condensed coil that absorbs the moisture and converts it into dry air. The operating principle is similar to that of a refrigerator.